Dr Peter Wilton is a world leader in customer loyalty and marketing disruption. He leads these disciplines at the Haas School of Business, UC Berkeley, the fifth-ranked business school in America and located adjacent to Silicon Valley where he has worked with the likes of Apple, as well as the biggest marketers across Europe, the Middle East, Asia and Latin America. Peter is also an Australian, averaging three months a year in Sydney. 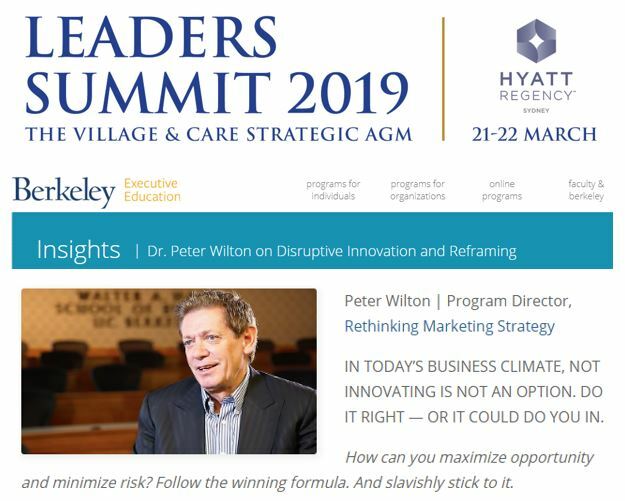 It would cost you tens of thousands of dollars to experience Peter in San Francisco, but next month you can learn from him at our LEADERS SUMMIT (Hyatt Regency Sydney, Thursday 21 and Friday 22 March). He is delivering a masterclass on ‘reframing’ and using a case study on the Leukaemia Foundation of Australia to demonstrate how we marketers in the retirement living and aged care sectors can lead real change. You can get a flavour of Dr Peter Wilton and ‘reframing’ in this UC Berkeley video. As Wilton observes, there are two wholly distinct strains of innovation, both fundamental to success. Sustaining innovation creates continuous, incremental improvements to an existing product or service for the customers you have today. 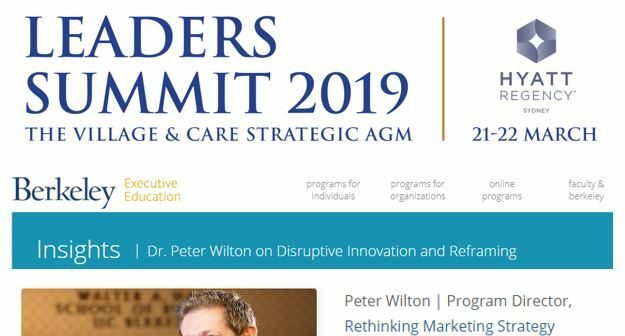 Disruptive innovation – what Wilton calls “reframing” – is an entirely new approach to creating value for your organization through something that does not currently exist to engage the customers you want tomorrow. Of the two, reframing innovation appears initially to offer higher risk … but also the killer rewards. Relying too much on sustaining innovation can pose an even greater risk: the loss of market relevance. The goal of reframing is to anticipate and unearth overlooked customer problems and aspirations and provide differentiated solutions and customer experiences that address those aspirations. Reframing is daring and differentiating, creating the competitive advantage that engenders active loyalty and advocacy. Reframing also provides a powerful ancillary benefit: the ability to attract top talent to your organization because they can be part of something that is reimagining the future. Previous ArticleDoes emotion sell the village offering, or data? Or both?